TOKYO: A Japanese scientist said Tuesday he has made violin strings out of spider silk and claims that -- in the right hands -- they produce a beautiful sound. Thousands of the tiny strands can be wound together to produce a strong but flexible string that is perfect for the instrument, said Shigeyoshi Osaki, professor of polymer chemistry at Nara Medical University. 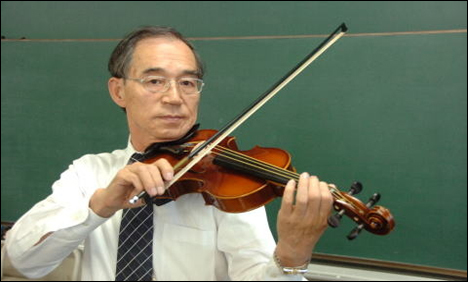 Osaki, who has been working with spider silk for 35 years, has previously suggested the material could be used for surgical sutures or for bullet proof vests, but his passion for the violin inspired him to create something with a musical twist. In the process of weaving the threads, their shape changes from cylindrical to polygonal, which means they fit together much better, Osaki told AFP. "During the assembly of normal threads there are many spaces between individual fibres," he said. "What we achieved left no space among the filaments. It made the strings stronger. This can have all sorts of applications in our day-to-day lives," he said, adding 300 female Nephila maculata spiders had provided his raw materials. The strength and durability of spider silk is not a new discovery, with previous studies showing it can withstand high temperatures and the effects of ultraviolet light. Osaki once produced a rope spun from spider silk that he said could theoretically support a 600 kilogram (1,300 pound) weight. the sonorous quality of the spider silk violin strings for their "soft and profound timbre". "Professional violinists have said they can tell the difference" whether the strings are on a Stradivarius or on Osaki's own $1,200 violin, he said. "It's one thing to create scientifically meaningful items, but I also wanted to produce something that would be socially accepted by ordinary people," he said.